I’m so excited to announce that this week I hit 200 Followers! I honestly cannot believe that that many people want to actively read my blog posts! My boyfriend always made me think of the amount of followers that I have like students in a classroom. If there were 25 students (followers) in a class, I’d be teaching 8 classes. That’s pretty crazy haha. I cannot thank you all enough for the love and support that you’ve all shown me so I thought that as a little thank you, I would hold a give-away! Also, anyone following me via WordPress or Bloglovin‘ will receive a bonus entry because this giveaway is really to say thank you to my blog followers. 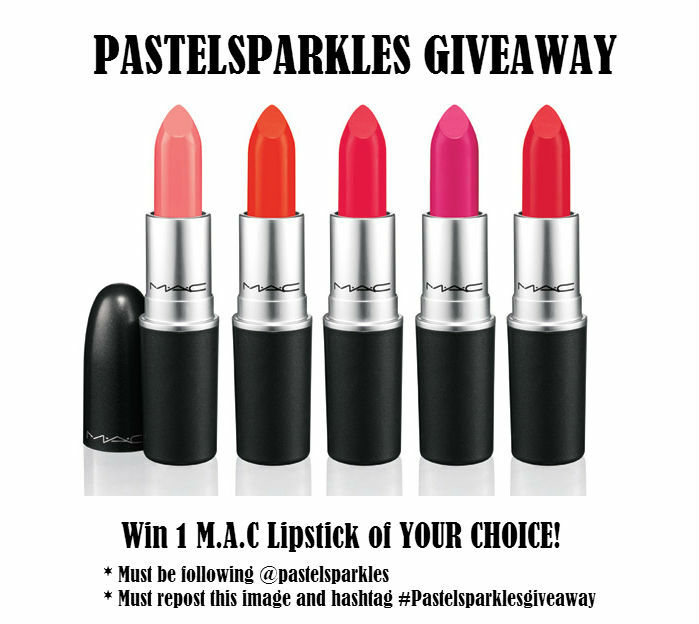 I am giving away one M.A.C lipstick of your choice. You can pick any shade but it must be a permanent shade because I cannot guarantee that I can purchase a limited edition shade. I am also limiting this to their regular lipstick line, including the Viva Glam lipsticks. One instagram entry per person, extra reposts will not better your chance at winning. It shouldn’t be a problem on WordPress, I don’t think, but there are no give-away accounts allowed, I will disqualify any give-away accounts. An additional entry will be rewarded to those who follow this blog via wordpress or bloglovin‘, this giveaway is, after all, for my followers. An additional entry will be rewarded to those who follow me via facebook. If you participate in an additional entry, please comment on this post and let me know! To claim the additional entries, you must do the two mandatory mentioned in rule 1 and 2, unless otherwise stated. This giveaway will start from 9AM Australian Central Standard Time (when this is posted) and run until 9PM Australian Central Standard Time on October the 8th, 2015. I hope that you’re all having a fantastic day ! Congrats to you! I follow you on Bloglovin’ as well! I already entered via Instagram. Thank you so much! I’ll make sure I add your additional entry 🙂 good luck! I’ve entered via instagram and I’m following your cute blog via Bloglovin too.